Your wisdom teeth are the third and final set of molars that develop in the back of your mouth. These teeth normally start to appear at the end of your teenage years and into your early twenties. If these teeth develop correctly and there is enough space in your mouth to accommodate the new teeth, you should have no problems with your wisdom teeth. However, for most people this is not the case and their teeth grow at an angle or do not erupt from their gum tissue at all. This puts pressure on the surrounding teeth and tissue, which results in toothache and general pain. Wisdom teeth that are partially erupted can become the site of tooth decay as they are difficult to clean. The extraction and removal of wisdom teeth is done to alleviate this pressure and prevent further damage to the surrounding teeth, tissue, nerves and jaw. Dentists will often remove a patient’s wisdom teeth when they are in their early 20s as a preventative measure. At this age, it is easier to remove the wisdom teeth as they have not solidified onto the jaw bone. Later on in life, removing wisdom teeth is a riskier procedure as there is a chance of damaging nerves in the jaw. Young children who are undergoing an orthodontic treatment, such as braces, will most likely have their wisdom teeth removed at the end of their treatment. Wisdom teeth can impact the alignment of other teeth in the mouth and therefore are removed as a preventative measure after braces have been taken off. Your dentist will be able to see your wisdom teeth through an inspection of your mouth or will be able to evaluate their position from an x-ray. Depending on their current position within your mouth, you dentist will decide on the best course of action. Prehistoric humans required their wisdom teeth due to their diet at the time. Their diet was typically more abrasive on the teeth than ours is today, and they needed extra molars to be able to eat their food once their front molars had been worn down. Over time, our diet has become softer on our mouths and teeth, and there is some evidence to show that our jaws are smaller than those of prehistoric man. Our change in diet had an impact on our teeth structure that made our jaws smaller, leaving no room for our extra molars. 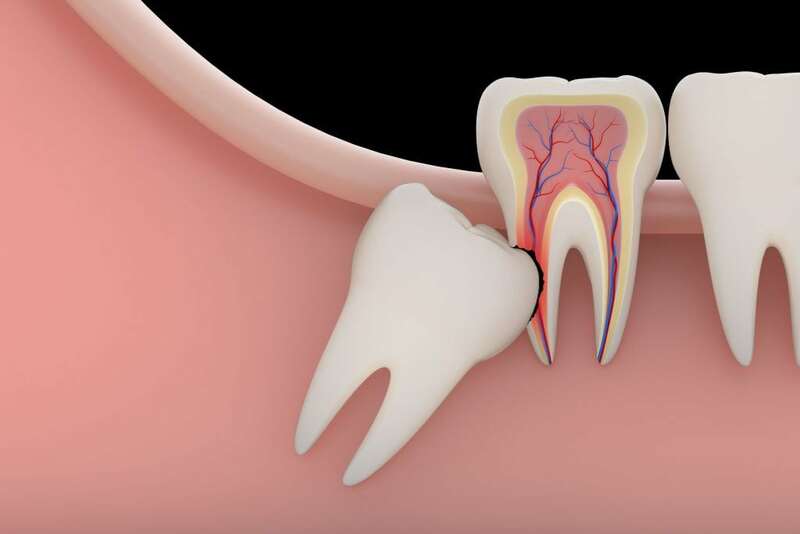 This is why most people’s wisdom teeth are unable to grow correctly, and end up being extracted.